6 Response to "Review: Peapod Is Kinda Awesome & $20 Promo Code"
Just signed up to give a try... thanks for the promo code! Yes there is a delivery fee. For orders under $100 it's $9.95. Which isn't too bad for me because I drive a huge car - $9.95 worth of gas would last me about 30 miles. There was also a "fuel surcharge" of about a dollar on my bill. And i tipped the delivery guy a few bucks. I believe that covers all the additional costs. I like peapod, and I don't mind the fee because of the time it saves. (time is money) I also try to use promo codes. To meet the minimum order I to stock up on canned goods, because those can get really heavy to carry on the T and walk home! Thanks for the promo code! And for the good review - I signed up afte reading it. My experience was v positive! 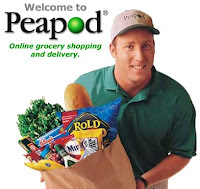 I just got my first Peapod delivery today. The whole process went extremely well. The Sunday morning slots after 8am were taken, so I picked the 6-8am. It was worth getting up early to have over $200 worth of groceries delivered to my door. There are usually 2 kids in tow at the store, and I am sure they will not miss going. For I plan to implement this into my weekly schedule.